From today you can visit the new Perini Navi Group website with all-new graphic design, an extremely intuitive and user-friendly structure, new sections and new content. 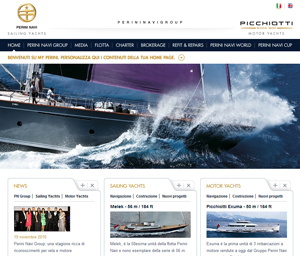 The restyling of the perininavi.it website was dictated primarily by the desire to create a single portal capable of keeping users up-to-date on news from the Group’s two distinct brands, Perini Navi and her sailing yachts and Picchiotti and her motor yachts. Elegantly desinged to make site navigation fast and easy, the “My Perini”, system allows users to decide how to personalize the content of their homepage and handle a large amount of information from different areas of the website, not just from the main menu. The content has also been enriched from the previous site. The sections Perini Navi Group, Media, Fleet, Charter, Brokerage and Refit & Repairs are now flanked by a new section called Perini Navi Cup. Another section called Perini Navi World allows users to download electronic wallpapers, to leaf through the company’s e-magazine stream, view a wide selection of photos and provides links to the Perini Navi Group’s YouTube channel. In the future there will also be a section called Crew Data Base dedicated to all those who are interested in the opportunity to work on board a Perini Navi or Picchiotti yacht. The multimedia content on the site, all of which is in Italian and English, is compatible with smartphones and tablets. You can see the website for yourself at www.perininavi.it.